In the present first part of the paper the mechanism of the binding of electrons by a positive nucleus is discussed in relation to Planck’s theory. It will be shown that it is possible from the point of view taken to account in a simple way for the law of the line spectrum of hydrogen. 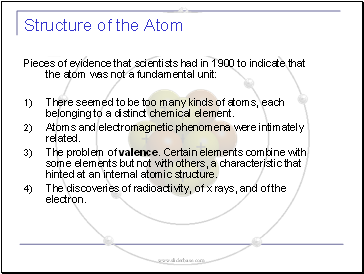 There seemed to be too many kinds of atoms, each belonging to a distinct chemical element. Atoms and electromagnetic phenomena were intimately related. The problem of valence. Certain elements combine with some elements but not with others, a characteristic that hinted at an internal atomic structure. 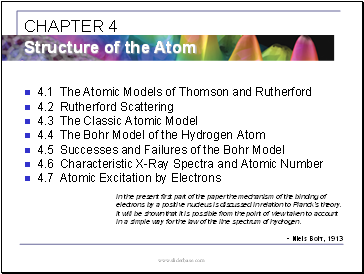 The discoveries of radioactivity, of x rays, and of the electron. 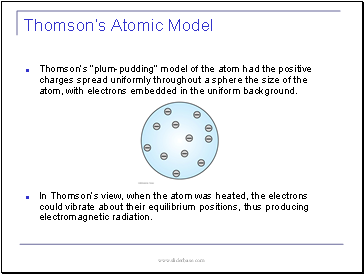 Thomson’s “plum-pudding” model of the atom had the positive charges spread uniformly throughout a sphere the size of the atom, with electrons embedded in the uniform background. 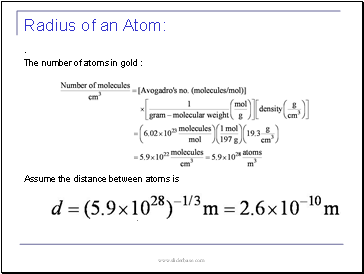 In Thomson’s view, when the atom was heated, the electrons could vibrate about their equilibrium positions, thus producing electromagnetic radiation. Rutherford, Geiger, and Marsden conceived a new technique for investigating the structure of matter by scattering a particles from atoms. 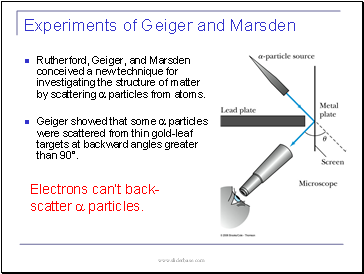 Geiger showed that some a particles were scattered from thin gold-leaf targets at backward angles greater than 90°. 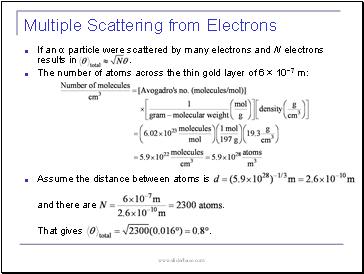 Electrons can’t back-scatter a particles. 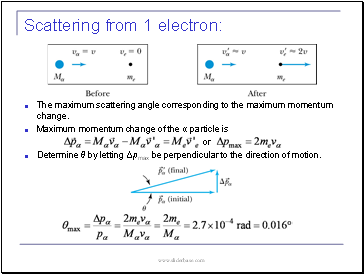 The maximum scattering angle corresponding to the maximum momentum change. Determine θ by letting Δpmax be perpendicular to the direction of motion.